Masks and packs are products that give our skin energy. Take time to pamper your skin 2-3 times a week. free of animal tests and vegan pack that soothes your skin with natural moisturizing factors. The addition of wheat germ-, avocado- and lecithinoil cares your skin gently. Zincoxyd and a special natural moisture-factor calmes and moisturizes your skin. For every skin type, especially for dry skin. Apply 2-3 times a week to cleansed skin. Leave the mask for about 20-30min and then remove it with warm water. free of animal tests, high quality mask for every skin type. 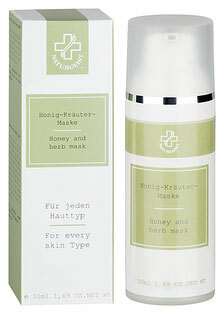 This valuable mask contains a special 6-herb-extract, honey and calming witch hazel. Apply 2-3 times a week on cleansed skin, leave for approx. 20-30 min., remove with warm water. Apply 2-3 times a week to cleansed skin. Let the mask work for about 20-30min and then remove it with warm water. This valuable care-mask contains jojoba-oil and a special natural moisture factor. Apply 2-3 times a week on cleansed skin, leave for approx. 20-30 min., remove with warm water. For every skintype, especially for dry and sensitive skin. free of animal tests, vegan peeling, frees the skin from calluses and dandruff. A mild cleansing mask with small abrasive particles made from jojoba-beads. Frees the skin from flaky callous, removing gently the inactive skin cells, simultaneously it pampers the skin. Also usable as body peeling. Apply the product evenly to your face, avoiding the eye area. Let the mask work for 5-10 minutes, then massage in with the fingertips and rinse with lukewarm water. 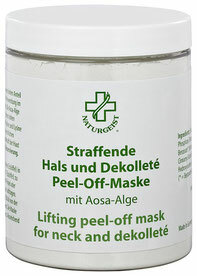 This firming peel-off mask contains a large proportion of AOSA algae, and was developed especially for use on the area of the neck and décolleté. Aosa algae belongs to the green algae family, and contains a large proportion of proteins that include the amino acids proline and lysine. These amino acids are also present in human elastin, which is responsible for skin elasticity and tone. Put approx. 30 g (about 4 level tablespoons) in a bowl and combine with 90 g water (about 12 tablespoons) to make a lump-free mixture. Use a brush or spatula to apply generously to the skin after cleansing. Leave to work for approx. 20 minutes. Then pull off in one piece. Remove any remaining product with water. The mask should be used once or twice a week. Soothing and balancing mask in addition of witch hazel distillate, honey, the anti-inflammatory zincoxyd, with a special natural moisture factor and a valuable 6-herb-extract. Apply 2-3 times a week on cleansed skin, leave for approx. 20-30 min., remove with warm water.